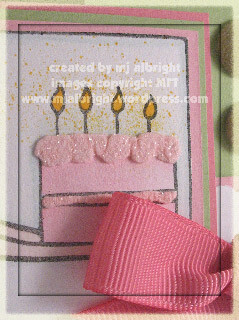 I used MFT You Take the Cake stamp set for this card. It was pretty simple to make. The only details I spent time on was the cake. I know they sell Liquid Applique in colors but I only have white. I squeezed some onto a plastic plate and added a drop of Cameo Coral ink from a re-inker, mixed with a tooth pick, and applied to my stamped image. Lightly sprinkled Dazzling Diamonds over the wet Liquid Applique. Heated to set. For the candles, I used my Summer Sun Stampin’ Write Marker and my Color Spritzer tool to add a little more details to the candles. I wanted to add Crystal Effects to the flames of the candles and forgot to do (I will add that when I done writing here). CARDSTOCK USED: Papertrey White; KI Memories My Girl Pop; SU! Certainly Celery, Pretty In Pink, and Regal Rose. INKS USED: Brilliance Graphite Black; SU! Pretty In Pink, Regal Rose, Certainly Celery, Blush Blossom, Mellow Moss, Soft Sky, and Always Artichoke Classic Stampin’ Pads; Summer Sun Stampin’ Write Marker; Cameo Coral re-inker. ACCESSORIES USED: Regal Rose 5/8″ Grosgrain Ribbon; Making Memories Velvet Brads; 3/16″ Corner Rounder Punch; Horizontal Slot Punch; Dazzling Diamonds; Aqua Painter; Liquid Applique; Marvy Square Scallop Punch. I WISH YOU ALL A SAFE & HAPPY NEW YEAR. So cute! That frosting looks completely yummy! Fresh like a Spring breeze! I love it! Super cute! Great idea adding the colour to the liquid applique!! I’ve never done that but will jot your idea down so I can try it sometime! LOL my house rarely makes it til midnight either….haha! I just love coming to read your blog daily, your work is amazing, and such great tips! Happy New Year! This is adorable! I love the splatter detail by the candles and the pink liquid applique. Very cute!